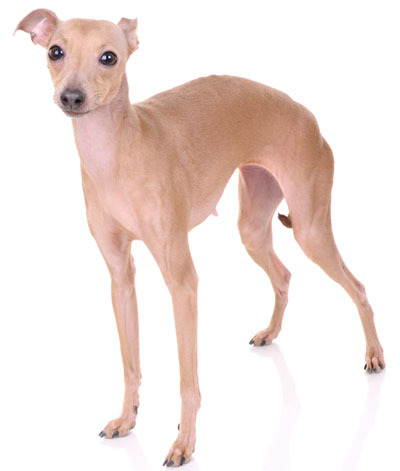 Learn about the temperament and personality of the Italian Greyhound. Discover what he's like to live with, his traits and characteristics and how he generally behaves. And look at lots of Italian Greyhound photos. Italian Greyhounds, or "iggies," are the prima donnas of the sight hound group. They are small, fragile, and emotionally high maintenance. Their one purpose on earth is to love you. They will follow you around everywhere you go, and an iggie parent must take care not to trip over his or her best friend as their bones are fragile. If you don't want your dog on the furniture, this is probably not the breed for you. They will also want to sleep in your bed, under the covers. They require lots of attention and affection, and if they don't get it, they can become depressed and/or destructive. Many iggies will poop in your house to punish you for ignoring them. They are notoriously difficult to housetrain. They require very close supervision and beware: they can hurdle toddler gates like nobody's business. Because they do not like to go outside if it is raining, snowing, cold, or if the wind is blowing, they often refuse to "do their business" outside. Some take months to housetrain, some years, and some are never fully housetrained. Many Italian Greyhound owners have resorted to using a litter box. They are active dogs and do need daily exercise, especially when they are young. (And they act like puppies until they are 2-4 years old!) They like to go for long walks, but aren't really fond of being outdoors, so they are not into games like fetch. If given the choice between walking on grass or concrete, they will usually choose the concrete. They cannot be trusted off lead. They can spot things 300 yards away, and they will chase anything they decide is prey: squirrels, ferrets, rabbits, cats, etc. They are also easily startled and may take off if something frightens them. They can run over 35 mph, so if they get away, you won't be able to catch them. And they have no road sense. They are intelligent, but not terribly fond of obedience. Due to their fine bone structure and sensitive personality, they do not make good pets for families with very young children or very large dogs. They are usually reserved around strangers. They can become particularly possessive of their owners, but do not make terribly affective watch dogs. While some iggies will bark to announce an approaching stranger, some will not. Some iggies never bark at all, while some whine, bark, and howl. Italian Greyhounds get along well with other dogs and cats. In fact, you might think they are part-cat based on the way they will lie on the back of the couch for hours gazing out the window. These little guys are an in-your-face breed: sweet, playful, peaceful, gentle, opinionated, manipulative, charming, curious, comical, happy, and affectionate. They will certainly expect to be the center of your lives. Oh, and they are also kleptomaniacs, so keep track of your stuff! The Italian Greyhound sheds a fair amount of hair. You'll find hair stuck to your couch, carpets, clothes and everything else in your home.